Alhamdulillah, we had a very good Hajj last year and everything went very smoothly. As usual, we will try our best to even further improve on our usual high standards. For those of you who have some intention / niat to go for Hajj this year, do call our office and register your interest with us. As soon as our packages are finalized, we will inform you. You can also check here on our website where the package will be posted. Meanwhile, we would like to take this opportunity firstly, to thank all our clients for their support and cooperation during the last Hajj. We are deeply humbled by the presence of so many repeat clients and their family members. It is the best compliment we can strive for. We would also like to take this opportunity to thank our great team of volunteers who gave so much to help us serve you. Their tireless and unselfish assistance is a major contribution to the success of the whole trip. To them all, we say Jazakallah Khairan. To all the passengers who gave us their feedback, a big thank you and we hope we can incorporate some of the suggestions that we have received to further improve our Hajj travel packages. Every year we face new challenges to put together our Hajj and Umrah travel packages. With the great changes taking place in the Holy City of Makkah, we look forward to the improvement made for the convenience and safety of the pilgrims. Umrah season has started. Do call us so we can arrange a package specifically to your needs. Whether you want 3 or 5 star hotels, private car transfers, rentals or taxis, shorter or longer stays in Mecca or Medina, we will organise your entire travel package for you. From all your bookings with the airlines, hotels and car companies to your visas, let us take care of all the necessary arrangements so you can enjoy peace of mind during your trip and concentrate on your Ibadah. As some period of travel coincide with peak international travel periods, book early to get the dates of your choice. Our Hajj 2013/1434 H package is now available and open for bookings. As seats are limited, we urge you to book early to avoid disappointment. Do visit our website regularly for news and articles about the Hajj. We look forward to be of service. 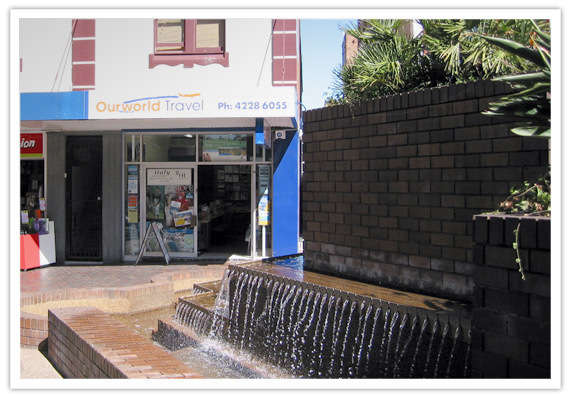 OurWorld Travel offices are located in Wollongong, Australia. Our Hajj and Umrah travel clients are mainly from Australia, New Zealand and Fiji. You can be sure that all your Hajj and Umrah travel needs are handled professionally and efficiently. Contact one of our Umrah and Hajj travel experts for more information at (02) 4228 6055 or you can email us here.